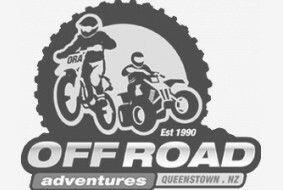 New Zealand’s original dirt and quad bike tour company, with 28 years experience, offer a real adventure! As the home of New Zealand’s best off road riding let this family of motorcycle and quad bike champions treat you to the Ride of your Life. We offer tailor made tours for families, beginner and experienced riders over 11,000 stunning acres. Based in Queenstown, New Zealand, we offer a range of all-inclusive guided quad (ATV) and dirt bike adventures. We supply top quality, well-maintained, late model bikes, along with all the riding gear you need to have a truly exhilarating off-road experience! Plus our passionate local guides accompany each tour. Groups are kept small to give everyone a challenging and exciting ride. We operate on sport quad bikes from kid’s 50cc bikes up to our LTZ 250cc sports quads with the option to upgrade to our 400cc model (+$50) also an option. Fun in the sun, awesome in the wet! FAMILIES: Minimum age for our quad bike tours is 6 yrs, Children under 16 years old require accompanying adults to ride with them for the duration of the tour and for obvious safety reasons the pace and terrain will be tailored to best suit the ability of the children in your group. 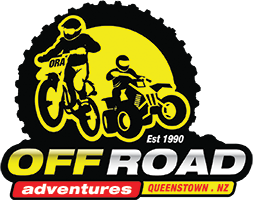 We provide return transport to the Off Road Adventures shop, a range of top of the line sports quads (50cc to 250cc quads), full face helmets, goggles, gum boots and gloves. Wet weather clothing included with MX gear available for hire. Action photos will be taken throughout the tour and are included. We recommend wearing sensible clothing (long pants and socks). Bring water, snacks and sunglasses with you and Go-Pro. No licence or previous experience is required. The minimum age is 6 years old to ride their own kids quad bike. Children under 16 years old require accompanying adults to ride with them for the duration of the tour and for obvious safety reasons the pace and terrain will be tailored to best suit the ability of the children in your group. Everyone will ride their own bike i.e.customer CAN NOT double on a quad bike. We provide return transport to the Off Road shop, a range of top of the line sports quads (50cc to 400cc quads), full face helmets, goggles, gum boots and gloves. Wet weather clothing included with MX gear available for hire. Action photos will be taken throughout the tour and are included. Minimum age for our quad bike tours is 6 yrs. Children under 16 years old require accompanying adults to ride with them for the duration of the tour and for obvious safety reasons the pace and terrain will be tailored to best suit the ability of the children in your group. Everyone will ride their own bike i.e.customer CANNOT double on a quad bike. Our adventure tour is designed for those looking for excitement and a challenge. This tour gives you the most amount of ride time (1.5 hours) within the half day tour. We operate exclusively on 11,000 acres of New Zealand's best off-road terrain. This extended tour maximises your experience, fun and ride time. With more time your guide can lead you on many more tracks and trails including hill climbs, creek crossings, gorge trails and tracks through historic gold workings dating back to the 1800's. We ride in small select groups and guide according to how you ride so whether you're a beginner or a professional you are guaranteed a challenging and exciting time. There is also the option to upgrade to our 400cc quads for an extra $50. Fun in the sun, awesome in the wet! Adventure Quad Bike Tour option not suitable for children under 12yrs of age. Children under 16 years old require accompanying adults to ride with them for the duration of the tour and for obvious safety reasons the pace and terrain will be tailored to best suit the ability of the children in your group. All tours are tailored to rider's ability in small select groupings so whether you’re a novice or professional you get a challenging and enjoyable ride. No motorcycle license is required but you must be competent on a motorcycle to take part. DRZ 125-250 dirt bikes are used with upgrades available to the DRZ400 ($319) and WR450 ($399). When booking please specify in notes if an upgrade is preferred, previous experience on a similar size motorcycle is required. We Provide return transport to the Off Road shop, a range of 4 stroke dirt bikes 125cc, 230cc, 250cc (with upgrades to 400cc & 450cc) available. MX Helmet, boots, goggles, gloves, pants and riding top. Action photos will be taken throughout the tour and are included. We recommend wearing sensible clothing (long pants and socks). Bring water, snacks and Go-Pro. No motorcycle license required but by booking a motorcycle tour you are confirming that you are a competent rider and able to operate the vehicle in a safe manner. Minimum age for our dirt bike tours is 16 years old with appropriate experience. 3 hours round trip with a minimum of 1.5 hours ride time. Tour extension maybe available with group bookings.